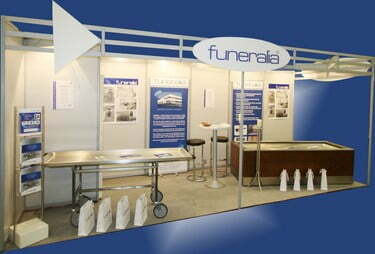 At the end of March, Funeralia – part of ‘the Facultatieve Group’ – exhibited at the ‘Altenpflege’ trade fair in Neurenberg. With 28,000 visitors, Altenpflege is the leading fair for the care sector in the German-speaking region. Some 700 exhibitors presented a wide range of medical products and services in Neurenberg. Due to the wide range of options and ergonomic design, there was a great deal of interest in Funeralia’s systems for transporting the deceased and also for their range of biers.